The Toyota car company made an announcement at the Consumer Electronics Show in Las Vegas 2015 concerning hydrogen fuel cell patents that sanctioned the car-maker company and other companies to access this hydrogen fuel cell royalty-free which was produced by Toyota. 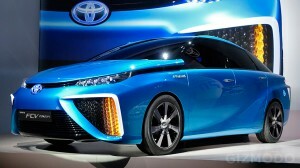 Bob Carter, Toyota’s senior vice president said, in this year between 2015 to 2020, the company will produce fuel cell patents accessible to every companies and manufacturers in connection to car making companies. Fuel cell buses and industrial equipment will be made available for more than 5,600 fuel cells. Not only for companies and manufacturers but they are also intended for those who sell fuel cell vehicles and its parts as suppliers. Also, for other related companies, an evaluation will take place if certain company will qualify to avail the patents. This is the first time ever that Toyota will make its patents royalty-free as a basis to other companies to share their fuel cell patents for free. “The first-generation hydrogen fuel cell vehicles, launched between 2015 and 2020, will be critical, requiring a concerted effort and unconventional collaboration between automakers, government regulators, academia and energy providers,” Carter said in a speech at CES. Fuel cells work by chemical fusion reaction between hydrogen and oxygen, which of course, you know, becomes water. But the electrical generation comes from the initial chemical reaction of hydrogen as it passes through the electrolytes where it creates a positive ion and an electron particle, which engineers harvest and use to power electric cars and other things. Fuel cells vary in design and power output and, in fact, it has been considered as a good fuel source for deep space travel as well as interplanetary and interstellar travel; however, the design is not complete yet and therefore may not be efficient for such purposes. So testing it here on Earth for decades (probably) would be a good thing as it will teach us a lot of things and help us improve the designs for future use. For fuel cell vehicles not owned by Toyota, the patents royalty-free will only be available within 2015 to 2020 while for those hydrogen fuel cell productions and for those productions completely owned by Toyota remains infinitely free. This is an excellent news for both old and new car manufacturers as well as start-up tech companies who want to venture into the industry also. We can expect to see dozens of achievements starting 2015 onwards, because of this bold and selfless move by Toyota. Bob Carter also said that his company will supply subsistence funding for the assistance of promoting the infrastructure in California and in the northeastern United States. Lately, on May 2014, the company disclosed a loan of $7.3 million for developing hydrogen fueling based in California Newport Beach First Element Fuel Company to give support to 20 fueling stations on the state. And also, Toyota declared of teaming up to French multinational Air Liquide to provides supply of mostly 12 hydrogen fuel cell station for New York, New Jersey, Massachusetts, Connecticut and Rhode Island.